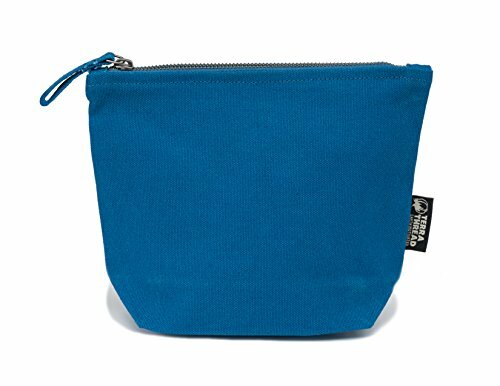 The Lok Travel Cosmetic Bag is handmade using 100% organic cotton and comes in a variety of colors including: olive green, cobalt blue, turquoise, sand, red, sunshine yellow, denim, espresso brown, charcoal grey. All of our Travel Cosmetic Bags are made at a Fair Trade Certified Factory. Sustainable Makeup Bag is here! Our makeup organizer bag is perfect to use as a coin pouch, travel pouch and of course cosmetic pouch. Proudly carry our fair trade cosmetic bag made with GOTS certified organic cotton. All of our fair trade products are made at a Fair Trade certified factory using 100% organic cotton, making them perfect sustainable bags. Gift these vegan and cruelty-free makeup bags to yourself as well as your family and friends. Your minimalist friend will thank you for this sustainable makeup bag. We also have a small cosmetic bag, perfect to store your keys, coins and more!